I just read the Commit messages guide, a guide to understand the importance of commit messages and how to write them well by Rômulo Oliveira. This returns JSON which includes the proxy's IP address if everything works as expected, which it did. 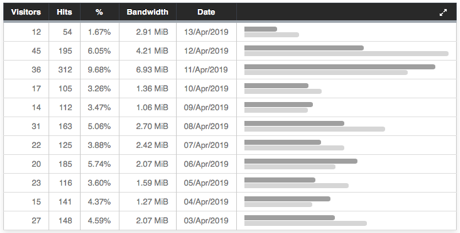 The above will show information about your current (external) IP address, similar to http://ipinfo.io/. For more information about jq, see the jq Manual. Today I also built the latest version of ProxyChains NG in order to get rid of the "ProxyChains-3.1 (http://proxychains.sf.net)" message the old version of ProxyChains prints to stdout. 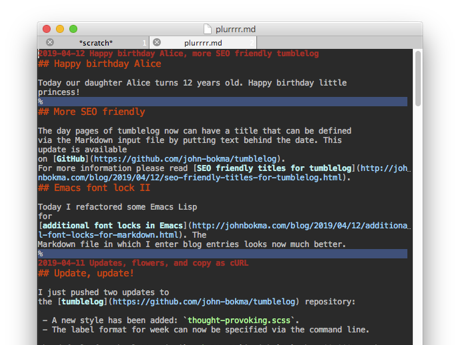 I just pushed version 1.0 of tumblelog, both the Perl and Python version, to GitHub. New are the --version option and a [% version %] tag. The latter can be added to the template. Yesterday, I used the PlantSnap app on my iPhone 5 to identify a flowering bush growing in my mother's garden. 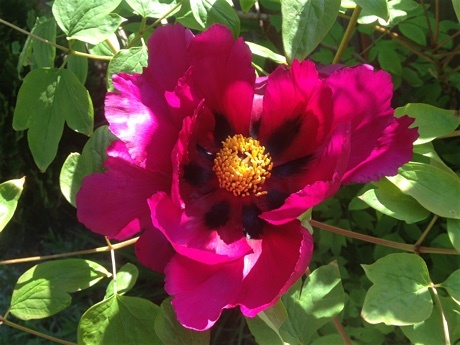 The program suggested that it was a Paeonia suffruticosa. Today the flower I took a photo of yesterday was more open so I took another photo for this blog. This morning I refactored the Perl version of tumblelog because I wanted to add next and previous links to the day pages. Yesterday, I had done some brainstorming and I concluded that quite a rewrite was required, which was indeed the case. In the evening I modified the Python version based on the new Perl version. Both versions are available on GitHub. Western Digital My Passport 2TB orange. 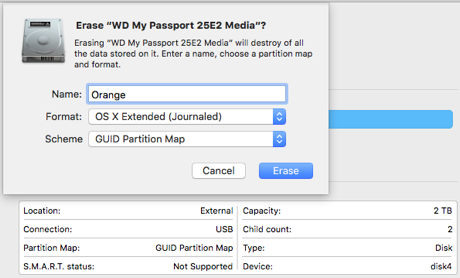 After I had unpacked the Western Digital My Passport I used Disk Utility on OS X to erase and format the drive as "OS X Extended (Journaled)". Erasing and formatting a drive using Disk Utility on OS X "El Capitan". Next, I selected the drive in Finder, selected "Get Info", unlocked the settings at the very bottom and turned "Ignore ownership on this volume" off. "Ignore ownership on this volume" disabled after unlocking. to start a complete backup of all Users data on the brand new Western Digital harddisk named Orange. 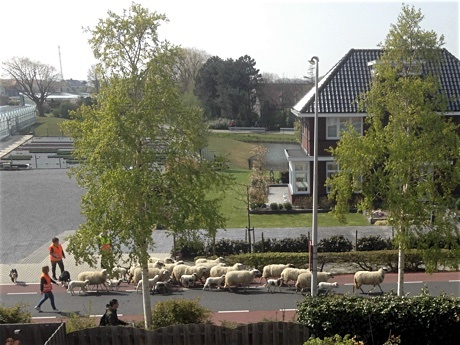 In the afternoon a lot of noisy sheep passed by. I took a photo out of my office window. 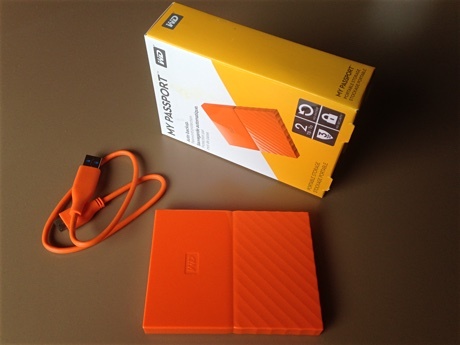 I just bought an orange WD My Passport 2TB online at MediaMarkt for €79.99. The external hard disk drive will be delivered tomorrow. Somehow my Revolut prepaid credit card was not accepted so I used PayPal to pay instead. The hard drive is going to be used to make an additional backup of my Mac mini 2014 as I want to do a clean install of macOS Mojave; I am still on OS X "El Capitan". Today I learned that there is a templating language that is a superset of JSON: Jsonnet. I just read What is a manifold? Easy to follow explanation. Ketamine was actually restoring many of the exact same synapses in their exact same configuration that existed before the animal was exposed to chronic stress. Use the Digital Color Meter to find the hexadecimal color code of a specific color on macOS or OS X. The program shows default decimal values. Select "as Hexadecimal" in the "Display Values" submenu available under "View" to obtain hexadecimal values. Switching the Digital Color Meter to hexadecimal. In the afternoon I used GoAccess to generate a HTML report with the access.log of this website as input. Excerpt of the GoAccess report: unique visitors per day. 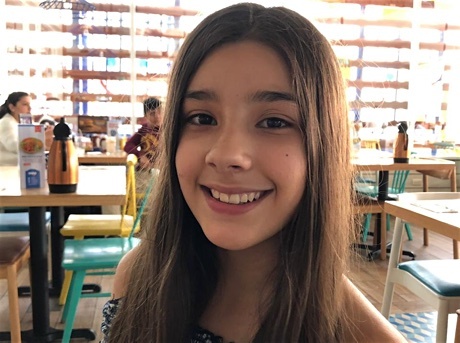 Today our daughter Alice turns 12 years old. Happy birthday little princess! The day pages of tumblelog now can have a title that can be defined via the Markdown input file by putting text behind the date. This update is available on GitHub. For more information please read SEO friendly titles for tumblelog. Today I refactored some Emacs Lisp for additional font locks in Emacs. The Markdown file in which I enter blog entries looks now much better. Alice at her birthday party at IHOP, Xalapa. Photo taken by Esme. After some playing with font-lock in Emacs I was wondering how to highlight the entire line when it just has a % character on it in Markdown mode. Entire line as in all other columns, with a background color. Now my blog posts in Emacs are separated by blue bars: Emacs with hightlight-regexp in Markdown mode showing blue bars. A new style has been added: thought-provoking.scss. The label format for week can now be specified via the command line. The default for the latter is 'week %V, %Y' with %V the ISO 8601 week as a decimal number with an optional leading zero and %Y the four digit year. 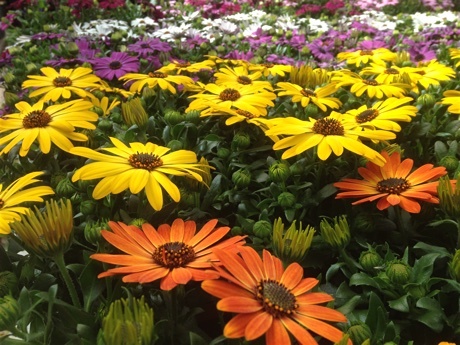 In the afternoon I went with my mother to the garden centre "De Carlton" near to her house. We had a coffee and I took a few photos with my iPhone 5 of the plants on sale. 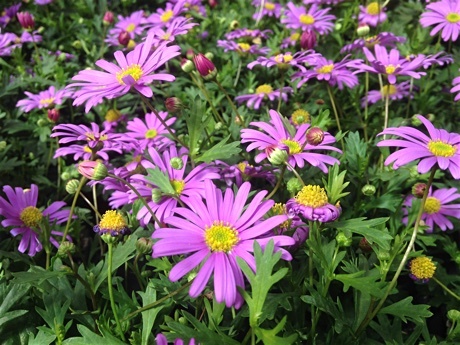 African daisies or daisybushes flowering; Osteospermum species. 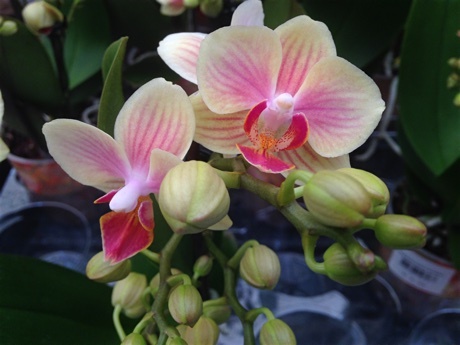 Moth orchid flowering; Phalaenopsis species. 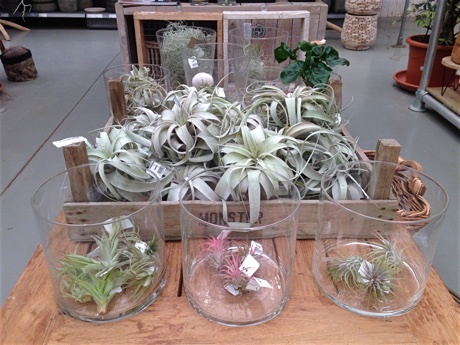 Tillandsia species for sale, including Tillandsia ionantha, Tillandsia xerographica, and Tillandsia usneoides. 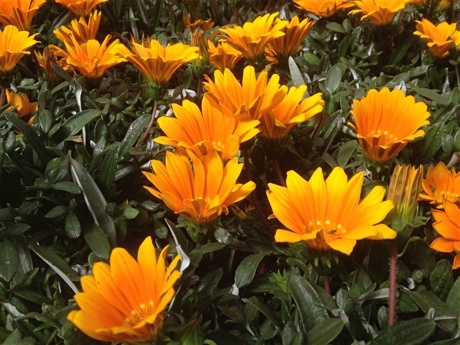 Treasure flowers, Gazania rigens, flowering. Select "Network" in the "Web Developer" submenu of "Tools". Reload the page. Right click on a URL and in the "Copy" menu select "Copy as cURL". Select "Show Page Resources ⌥⌘A", right click on a URL and select "Copy as cURL". Another tumblelog style has been added; adrift-in-dreams.scss, see my GitHub repository. I just made screenshots, using Firefox, of the themes I have created for the tumblelog program and added them to my GitHub repository. I have been playing with font lock in Emacs and managed to give a specific face to each line starting with an ISO date. I use this in Markdown mode in which I write this blog. I will blog about this on my main blog tomorrow. Source: How to disable past dates in Jquery Datepicker. I just pushed another update to of tumblelog. This time I modified both the HTML and SCSS to make styling of a tumblelog easier. I also made the HTML slightly more semantic. Enjoy! Read about it in Native Lazy Loading for img and iframe is Coming to the Web by Ben Halpern. Currently listening to one of my favorite Yello albums; Pocket Universe. -f - Fork in the background. -N - No command is sent once the tunnel is up. -C - Compress the data before sending it. -D - Dynamic application level port forwarding. Supports SOCKS protocol. The above creates a SOCKS proxy listening on port 1080. See also How To Route Web Traffic Securely Without a VPN Using a SOCKS Tunnel. Note the LINES TERMINATED value, which must be '\r\n' if the file was created on Windows. If on Linux, use just '\n'. Don't forget the LOCAL otherwise MySQL can't execute the command if running with the --secure-file-priv option. While blogging for Plurrrr I bumped into a rendering issue which I could track down to a re.sub in the Python version of tumblelog. Read about the issue and the fix in Python re.sub gotcha. The Python version of tumblelog has been made available on GitHub. For more information see Create a static tumblelog with Python. Normally GNU make shows each line of the recipe that's executed on stdout. Putting an @ in front of a command prevents this; see Recipe echoing. I use ⌃L to clear the terminal. This has the same effect as pressing enter n times with n the number of lines in the terminal. So scrolling back is possible. If I want to prevent scroll back or don't care I use ⌘K (Clear to Start). Copyright © 2019 John Bokma. Palette taken from the Soothe Theme for Emacs by Jason Milkins. Pages generated with tumblelog 1.0.